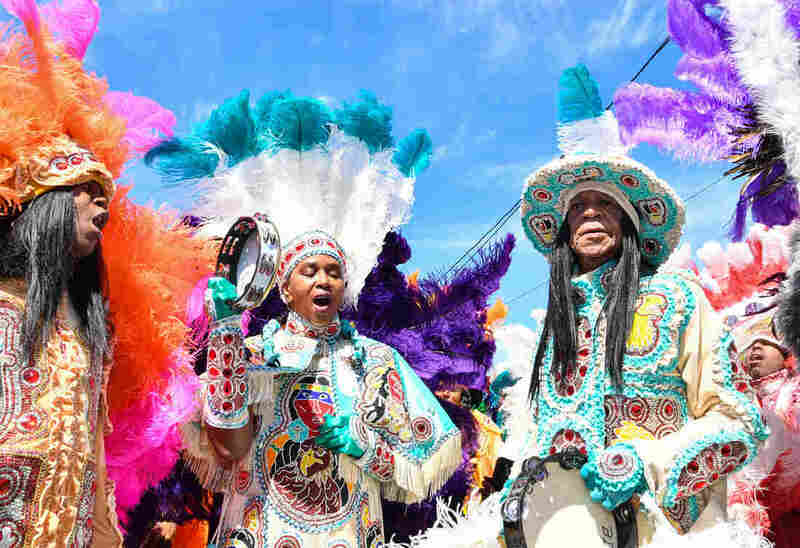 Inside 'Indian Red,' The Anthem Of New Orleans' Mardi Gras Indians African-Americans in the city have paraded in spectacular regalia inspired by Native American motifs for more than a century. The song of the Mardi Gras Indians exudes joy, defiance — and mystery. Mardi Gras Indian Big Chief Monk Boudreaux (right) and members of his Golden Eagles tribe in March 2019 in New Orleans. For well more than a century, being in New Orleans for Carnival Day and other cultural events has meant at least two things: seeing groups of African-Americans parading in spectacular regalia inspired by Native American motifs, and hearing an anthemic song that brings them together in good times and bad. The first recording of "Indian Red," sometimes called "My Indian Red," dates back to the 1940s, but the song's history goes far deeper. "Indian Red" has as many variations as the Mardi Gras Indians themselves. Their tradition honors a friendship with Native Americans that some say dates back to slavery, when the two cultures are believed to have exchanged many kindnesses. After Reconstruction, the Mardi Gras Indian tradition became more representative of the African-Americans who take part each year: an expression of self-love and self-pride, with an emphasis on African religious and cultural origins. "In the Seventh Ward there was a yellow and white outfit — I don't even remember who it was — that was so beautiful, man," Thomas recalls. "I think it was a Mardi Gras that was dreary and the weather was bad. So whoever that Indian was, he brought the sunshine." The suits are vital. But the power that the Mardi Gras Indians exude when they walk the streets and sing is spiritual, as well — and mysterious. "Indian Red" opens with the phrase "Mighty cooty fiyo!" No self-respecting Mardi Gras Indian will say what that means, but make no mistake — this is a warrior's anthem. I visited Big Chief Lil Charles Taylor of the White Cloud Hunters in his living room, where he has plumes, satin and feathers on display. Like any good Mardi Gras Indian, he hand-sews his suits. Taylor says he's been parading — except in times of illness — since he was 2 years old. He's 65 this year. "The first song you would always want to learn is Indian Red — that's the prayer," Taylor says. "You sing as your tribe is beginning to leave, to hit the street. And the whole object of it is to hope that they all come back." Sounds dire, right? It kind of is: There's plenty of rivalry on the street between Mardi Gras Indian chiefs — and their tribes. "I seen an Indian hit another Indian with a hatchet in his face — hit him right in the center of his forehead with that hatchet," Taylor says. Part of a chief's responsibility, he explains, is to keep the peace. There's a lot less violence now between Mardi Gras Indians, and a lot more trash talk. But tribes are still wary of police: In 2012, the New Orleans Police Department was placed under a federal consent decree brought on by a history of biased policing and civil rights abuses. When relations were poor, the Mardi Gras Indians stood up for themselves, heeding the spirit of a line from "Indian Red": "We won't bow down, not on that ground." Katy Reckdahl has reported on the situation for more than a decade. "The NOPD was very out of control, and I think that a lot of what was happening was just racism," she argues. "Majority white in mindset, maybe, not majority white in actual demographics. There were black and white police officers that were part of the problem." Allison Montana — aka Big Chief Tootie Montana of the Yellow Pocahontas — helped bring about peace in our time. Decades ago, Montana (who died in 2005) began urging the tribes to drop their animosities toward each other. He encouraged them to concentrate on other Mardi Gras Indian traditions: sewing, dancing and singing the repertoire right. But does this old song sound too old today? Cherice Harrison-Nelson is the daughter, and sister of Mardi Gras Indian chiefs, a queen of the tribe Guardians of the Flame and a school teacher. She says she and her family have decided to drop the words "Indian Red" when they sing the song. "It's not right for us to sing, because we know better. I don't know how many Native Americans would call themselves Indian Red," she says. "Everything else about the song, I love. We sing 'Guarding the flame' [instead], and that's what we teach our children." 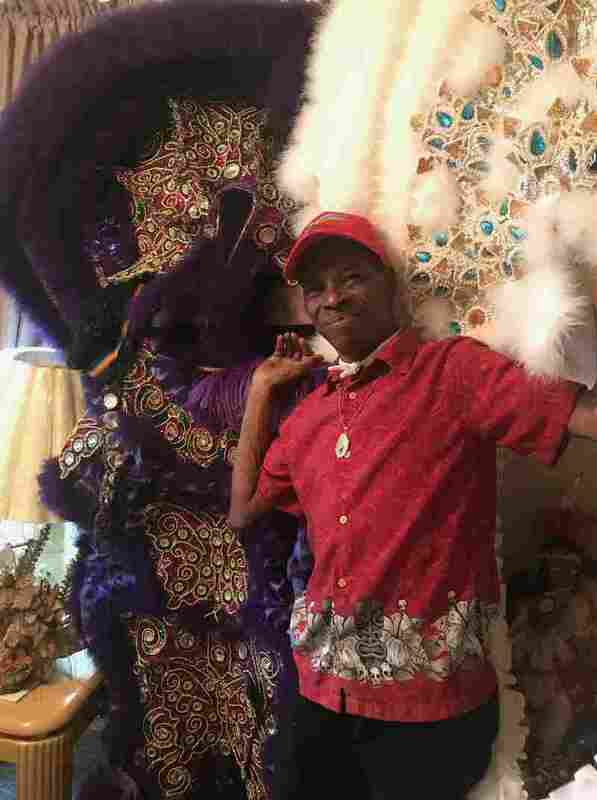 Other Mardi Gras Indians will have to decide for themselves. For his part, Lil Charles Taylor — who is preparing for his final year as big chief of the White Cloud Hunters — says he's not changing a word of the song. He's performed at Carnegie Hall, in Paris, at the Smithsonian, and on the National Mall. He's sewn his suits through hurricanes, a hernia, a liver transplant and divorce. "I enjoyed it the whole time I took part. It was a pleasure and I'll always love it because I'm an Indian myself. But once I retire next year, that will be it. I think I've done my duties," he says. Taylor's final suit will be peach, the only color he's never worn. He's already sewing.